“All the news that’s fit to print” says the New York Times. So it is that Ellen and Reid see the good with the not-so-good. Ellen/Reid: About all I’m sure of this week is that our weather is better than your weather. And that’s probably not saying a whole hell of a lot given that tonight we may get some freezing precip. We played golf yesterday in the sunny 60s so whatever we get later on today may be a bit of payback by the Almighty. It would serve to test our collective mettle. The lot of us down here are a bunch of weather wimps. I guess there’s this new reality TV show Party Down South in which the only reality is it’s more ‘necks getting drunk. I haven’t seen it – I won’t see it – but it must offer up quite the image the South wants to project as a backwater region. Maybe it’s in keeping with us as multi-state populace that is hell bent on snubbing public education and all that learnin’ that goes with it. Good God, we deserve everything we get. It’s morbidly hilarious. When I was in Journalism School at Nebraska, we had a j-professor named Dr. Walklin (really a humorless and hard but inspiringly great teacher) who called this sort of programming the lowest common denominator, that is, it would appeal to the largest swath of audience. Man, they hit that right. Don’t start me on those Duck morons. I haven’t seen that either but having shot my share of ducks back in the day, it occurs to me ‘How many ducks can one family eat?’ Trust me, a little duck goes a long way. That show has gotta be more of that denominator stuff. I’m dating a little bit and it’s not turning out so well. There was one where I said “Hello” and that was almost literally the last thing I got to say. There was no way to shoehorn in another word, let alone a full sentence. I was trying very hard not to look at my watch. That is things in a nutshell. To be sure there have been a couple of nice people. My intent was to just get out but now I just want to stay in. That has its merits. My golf group is perhaps all the socialization I need. Here’s a few participants in my social group: golfers. It’s probably all I need. Every Saturday morning very early I see an older gentleman out walking his dog. His name is Tom Philips and years ago he sold developers a chunk of land that now bears his name: Philips Place, that upscale eatery/shops place where you guys and I would eat. Tom is a good guy and we talk sports a few minutes before parting. He lives on the parcel directly behind my house, and now he’s sold that too for development. In a week or so he and his wife move out to head up the way to posh Lake Norman. I’ll miss seeing him. He called me a ‘good man’ last week for doing what I do, which is to pick up junk. My old awful Acer laptop finally gave up the ghost and trying to transition my Caldwell church newsletter to Pages on the MacBook Air has been a complete and utter disaster. It’s nearly incomprehensible for me to understand the instructions and nuances. I went up to the Apple store last week for guidance and the young people armed with iPhones and iPads working the floor looked at me like I was an idiot, which I may well be. They keep telling me how ‘intuitive’ these Apple products are, but if indeed my Mac and Pages are thusly so, I’ve yet to feel the vibes. Reid, seriously, let me know when you and Liz can come down there or me up there. Send me some dates that work for you guys. Ellen, I’ll keep working for a warm weather thing. Based on our FaceTimes, it looks like you guys could use it. Couldn’t we all. Razzing the kids about our balmier-than-yours weather is great sport for their old man. They’d roll their eyes if you asked them how many times I’ve dumped on them about weather. They’re used to the jabs. Ellen/Reid: This time last week it was 7 degrees and the locals – me included – were hunkering down. Coldest in a decade said the weather gurus. You guys are crying crocodile tears given the freeze box you’ve been trapped in but it’s likely all relative. Cold is cold. A couple of days later, though, it was back in the 60s and I was outside walking and golfing. What it does do is bolster the idea of split time between here and the Midwest. Reid, you need to bring me up to speed on your suggestion about short term rentals. I could live with that. Something back in the greenbelt caught my eye last week. It was a Sharp-shinned hawk tearing some hapless beast to shreds. I got out the binocs but could make out quite what he was eating chunk by chunk. The hawk was very handsome. He (or she?) was clearly in no rush to gulp down the meal. It stood on a log and went rip-rip-rip. It was probably at least 45 minutes while he/she ingested his prey. That was fun to see although the victim obviously didn’t think so. Wish I had a Nikon with a 500mm telephoto lens. Where’s the Nikkormat when you need it? Do you still have that beast, Reid? I got two new bosses in the space of one week. Yeesh. Betsy thinks it might be some type of world record. Monday’s boss made the handoff to the new guy (who’ve I’ve known and is a nice guy) on Friday. I’ll roll with the punches and am nothing if not adaptable. My eye remains on retirement. I had as much fun on the golf course yesterday as I’ve had in a long time. The weather was sunny and within an eyelash of 60 degrees. There were just four of us so I was spared putting together pairings for a larger group. 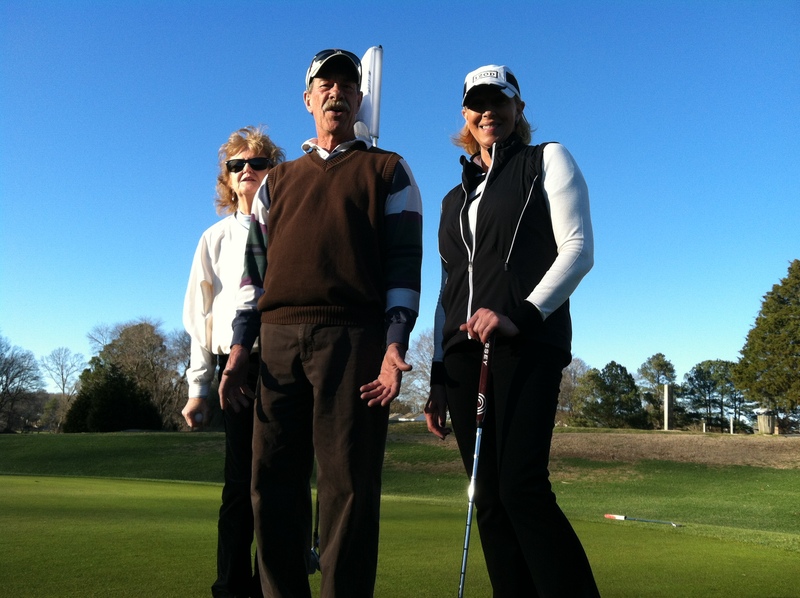 Stalwarts in my golf group: Pam, Ray and Ruth. This pretty much is my social life. It was women against the men for a cold beer, and my boy Ray made a couple of good shots to pull things out on the last hole. I wasn’t a hell of a lot of help to him. He pretty much carried the day. 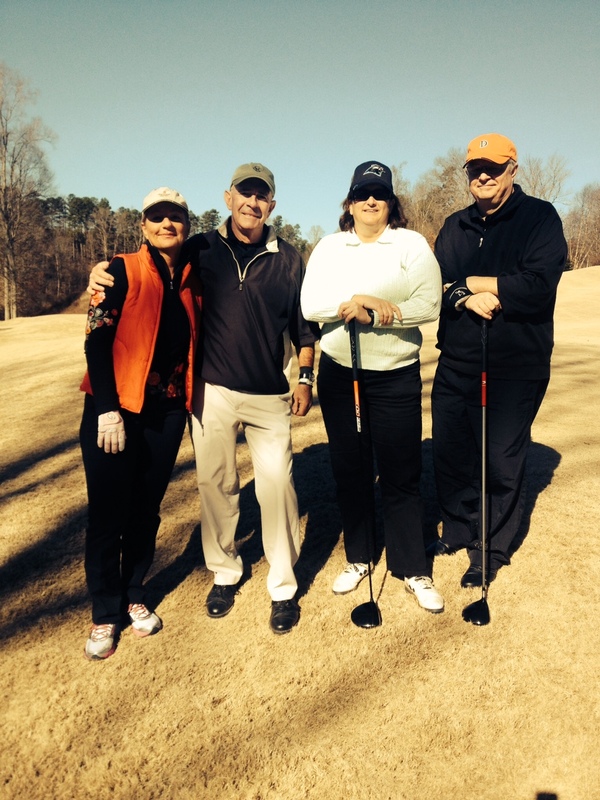 You can check out my golf group on Meetup (look for Golf for One) in Charlotte. I post a lot of pictures. I was not a supporter of our efforts in Vietnam; it just didn’t make much sense to me. It also claimed several people I knew. And now, all these years later, it has claimed a friend. Ellen and Reid knew of Jim. What they did not know until now was his circumstance. Ellen/Reid: My good friend Jim McGough died in Des Moines late last week. His service is today and I won’t be there. He met you when you were peanuts, so there’s no reason for you to remember him, but I do and he was a great person. I both worked with and for him at Meredith, and he was a great boss and an even better person. In a way, Vietnam has claimed another victim. What took him were complications from hepatitis he contracted from a transfusion after he suffered a battle wound. He told us about it years ago and I suppose he felt ultimately it would get him, and it did. He was flanked by two other soldiers trying to take a position. As he described it, the Viet Cong used pipe-shaped grenades which tended to send the blast out the ends; his two comrades were killed. Jim was injured but spared. But what I remember most was his humility and willingness to deflect conversation from him to you. That is an admirable trait. He was one of my first visitors in Charlotte, and it was great to see him then. I knew of Jim’s plight only through Pam Kenyon and Diana Willits, so I was in touch with Jim a couple of months ago. True to form, he didn’t want to talk about himself but about me. We’d be a hell of a lot better off with a lot more people like Jim McGough. Tim nailed it on where to put the kayak into the water for a maiden voyage. Beaufort, SC sounds like a great spot. I’ll probably take baby steps first with shortish jaunts until I find my sea legs. Fly fishing would be the ultimate, but I’ll probably spin cast until I really get the hang of things. I’d be leery of standing up to cast but maybe that trepidation will go away. But the prospect of being on the water really is appealing. Plus, it would give you guys something else to do when you visit. Self-sufficiency is a good thing over the holidays when the distance between you and your kids is measured in hundreds of miles. A good 60’s band, some cold weather golf and an unexpected new friend help to remedy that, as they learned last week. Ellen/Reid: The fake little Christmas tree went down without so much as a fight yesterday while I watched football. In the space of 20 minutes all the ornaments and lights were tucked away until just after T-Day 2014. Anyway, it was raining cats and dogs so it was a good time to stay indoors and get some stuff done. Contributing to the indoors work was a heavy price paid cold and sore throat-wise for the idiocy of playing golf in 25 degree weather on Christmas day. But the Christmas season is now a wrap. Your adventures up in MSP with your mom looked fun. New Year’s Eve should be pretty quiet, too. No real plans other than heading to a blues place to hear a ‘60s band. I tried to rally a bunch of people from my golf group to go but that went over like a lead balloon. But I still plan on heading there for a couple of hours although I will be out the door long before the clock strikes midnight. Instead of party hardy it’s more like party hardly. 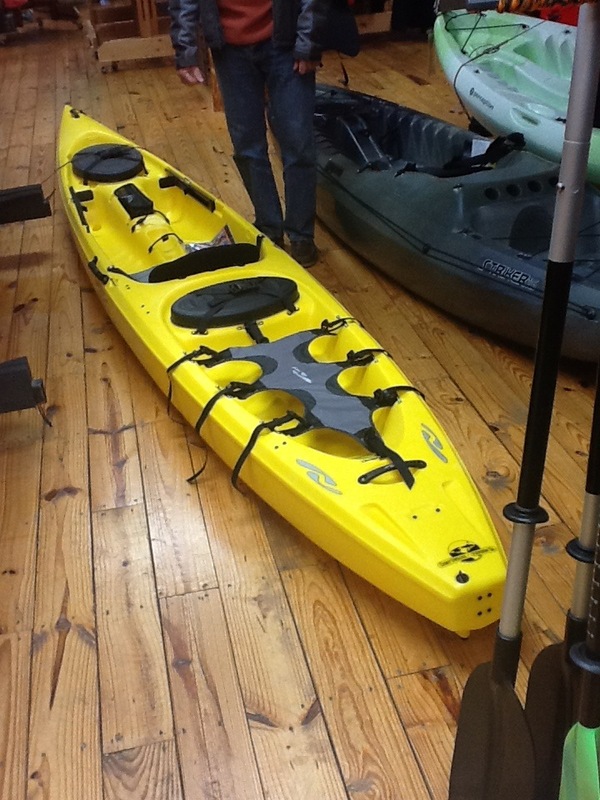 Room for one: this baby can handle the saltwater flats and my overnight gear. A new adventure/challenge and a good springtime gig for redfish. plus they say you can drill holes in it (measure twice, drill once) for rod holders and such. A reasonable commitment would be to head toward the salt marshes once a month or so for some solo fishing. Ellen, Tim is really going to have to school me on how to go after ‘reds’ since I have zero experience in these matters. I won’t fly fish for them. It’s a whole new learning curve. Reid, I can’t do worse than our ill-fated deep sea excursion with Captain Curly and his goofy crewmen Moe and Larry last Christmas. What a disaster. But I am super excited about this. I also need to get away from golf for a little while and there’s nothing wrong with going casting a line every so often. Geez, I’ll have most of the boy-toys covered: an old Harley, golf clubs and a kayak. Going to the YMCA all these mornings to watch people buff up has me thinking about marathoning again. Not running one, but coaching serious runners. My 2:24 and sub 30 minute 10K times should buy me some credibility although I don’t know how to go about it other than posting a note in the locker room. I don’t want to get involved with running clubs and the like but would rather work with one or two individuals who want to put the pedal to the metal in the 2:40 – 2:20 range. That would be interesting and a lot of fun. We’ll see if there are any takers.